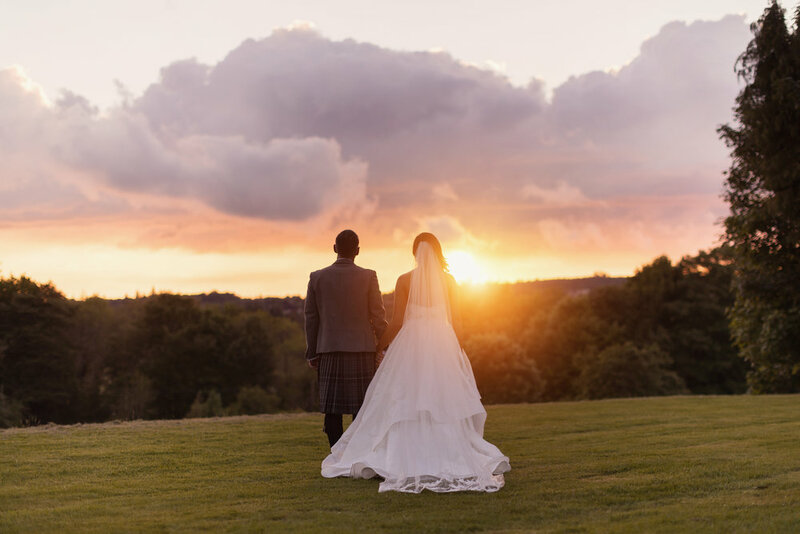 If you are hoping to plan your Wedding at a truly incredible castle location in Scotland, with an overwhelmingly magical backdrop and a beautiful setting for your accommodation and Wedding breakfast, then look no further! Whether you are planning a destination elopement wedding for 2, an intimate Scottish Wedding for your closest friends and family or a larger Wedding for up to 60 persons – We have the perfect combination that will blow both you and your guests away. Together with the iconic Dunnottar Castle and the luxury Wedding venue that is Ardoe House Hotel, we have devised an all-inclusive destination Wedding package that will be a perfect fit whether you are eloping to Scotland or booking an intimate and luxury destination Wedding. Arrive to the clifftop ruined castle, with the sound of the ocean in the backround and a Bagpiper* playing for your arrival. Make your way to the castle, with the Bagpiper leading the way, covering over 200 steps weaving up to the medieval castle atop an enchantingly beautiful cliff. Once you reach the castle, you can take shelter in the beautifully refurbished Drawing room for your Ceremony or choose an outdoor location that you wish. With space for up to 60 people at the castle itself, you can be sure that everyone will be bemused by the beauty and magic of this amazing place. Be amazed by the castles magical setting and surroundings and the incredible, ancient Scottish history that took place here. 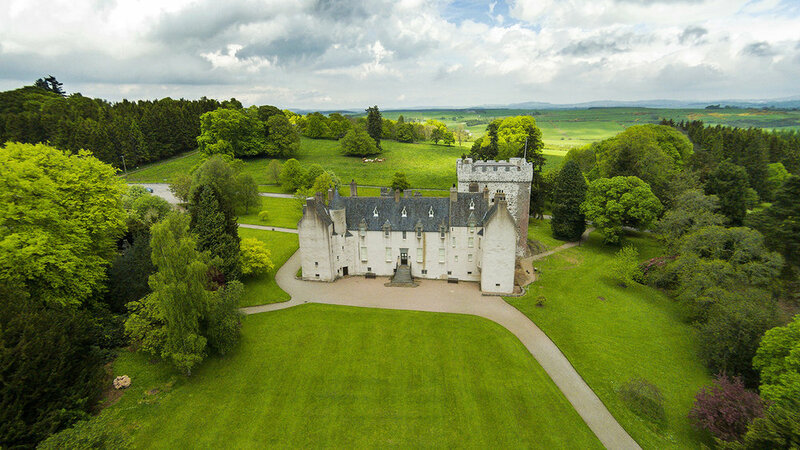 You and your guests will gasp in awe at the sight of such an incredible place in the world – A stunning setting for even the most eager of Outlander fans looking for an amazing Scottish castle as their Wedding venue. After your Ceremony, enjoy a glass of fizz** on the lawn and let your guests take their incredible surroundings in as your Photographer takes you to the many beautiful, natural locations around the castle for photographs that you will treasure forever. *Piper is not included in the package, though we highly recommend having one. **Bridal couple must provide own drinks and glassware. On returning to Ardoe House from your Ceremony, yourselves and your guests will be greeted with an arrival drink to enjoy before being called for dinner. First up, the speeches by your close friends and family (washed down with a glass of fizz of course), followed by a delicious 3 course Wedding breakfast with wines to enjoy throughout dinner. Tea and Coffee will follow and later in the evening a buffet of bacon rolls or traditional Scottish stovies will ensure nobody goes hungry as the nights fun begins! Your guests will benefit from flexible bedroom bookings and 10% discount on rack rates at the time of booking your wedding – So everyone can enjoy the change to stay at this beautiful luxury hotel in the gorgeous Scottish countryside, just 15 minutes from the city of Aberdeen. What are you waiting for? Get in touch today to find out if your preferred date is available! Terms: Offer Valid Dec 2017 through to Dec 2019 Thursday – Sunday Weddings only. Off-peak Fridays and Saturdays at special request only. All offers are subject to availability. To obtain this special package you must book your Wedding through Timeless White Scotland. Up to a maximum of 25 bedrooms can be reserved for your Wedding guests at the discounted rate, subject to availability.